Bradley-Wright Phillips. Courtesy Red Bulls. 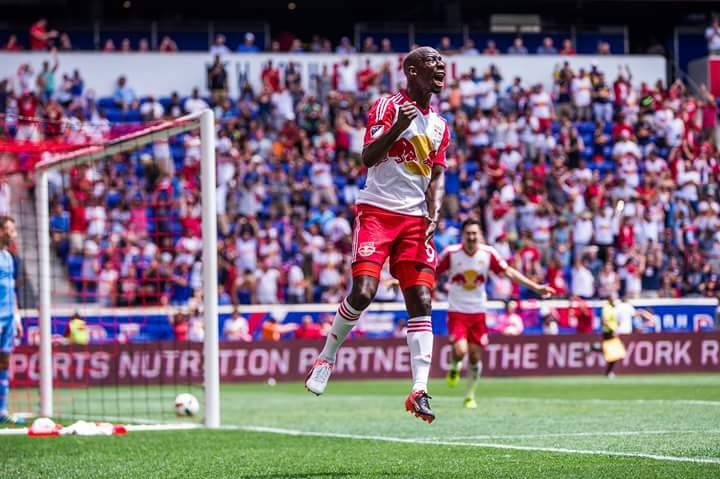 The New York Red Bulls clinched first place in the Eastern Conference for the second straight time, and for the third time in four years, as they beat the Philadelphia Union 2-0 on Sunday. The Red Bulls finish the regular season with a 16-9-9 record, 57 points, after going 15-3-9 following a 1-6-0 start. They finished on a 16-game unbeaten run, the third-longest undefeated streak in MLS history. Only FC Dallas (19), Columbus Crew (19) and Real Salt Lake (18) have longer streaks to their name. Their home record of 13-2-2 and goal differential of +17 were best in the MLS. Bradley-Wright-Phillips opened the scoring in the 26th minute, as he collected a long pass from Aurelien Collin and chipped it by goalkeeper Andre Blake. Alex Muyl got his second goal of the season to give the Red Bulls a 2-0 lead in the 57th minute. Wright-Phillips won the Golden Boot for the second time in three season, as he finished the regular season with 24 goals. He led the league with seven game-winning goals. Wright-Phillips accomplished the feat without any goals from the penalty spot, the first player to win the Golden Boot without a PK since Luciano Emílio accomplished the feat with D.C. United in 2007. He set a new MLS record for most goals scored over three consecutive seasons with 68 goals from 2014-2016, and is the only player in MLS history to record multiple seasons with 20 or more goals. Wright-Phillips said of winning the Golden Boot, "Like I was telling the team before, it isn't everything because I've won it before and the team didn't win the MLS Cup and at the end of it all I had was the Golden Boot but the goals didn't for anything unless you win the MLS Cup." Red Bulls Head Coach Jesse Marsch said of Wright-Phillips scoring in this one and winning the Golden Boot, "Obviously we are all really excited for Bradley. It's a huge individual accomplishment, no doubt. He was quick to thank the group in the locker room after because he knows that it takes a group effort. Certainly Bradley has been huge for us this year and comes up with big goals at all moments. He is in a really good way right now and I think our whole group is in a really good way right now. We are looking forward to the possibilities and who our matchup will be to get ready for next weekend." Wright-Phillips said of the Red Bulls rolling into the postseason with the unbeaten streak, "That's what we wanted and that was the plan. We wanted to be a strong team and come into the playoffs strong but more importantly we wanted a clean sheet. I know there has been a lot of talk about how we give up goals this season but we wanted to correct those wrongs." Marsch said of closing out a tight win on the road, "It's always fine lines between success and failure in different moments. When we had a 2-0 lead, I think we have to make a few more plays, we played in their end a little bit more. We were a little tighter in the back and we didn't give up too much but we still had to come up with a couple of saves and that is what it's like when you have the lead, especially on the road. I think this will build confidence within our group and certainly means, even though I'm answering my own question, hopefully we don't have to answer these questions as much because we have belief in our team and have belief late in the games." It is possible the Red Bulls will match up with Philadelphia next weekend in the second round of the playoffs. Philadelphia, the sixth-seed in the East, takes on #3 Toronto in the first round one-game playoff on Wednesday. Philadelphia Head Coach Jim Curtin said of adjustments ahead of the playoff game, "It's a one-off game. It's not like it's a situation where they had more rest than us or anything like that. It's a quick turnaround. In some ways, that probably suits the team that's going on the road. Again, it's difficult to get yourself prepared in a quick amount of time, but our group's done well, if you look at our record when we play in the Wednesday games, on the short weeks, we've gotten results. We're confident that we can do that. We have some things to clean up defensively. Some of their strengths and weaknesses, trying to take away Michael Bradley, Giovinco and Jozy is a big task, but we'll talk about that right now, to be honest, and we'll get ready for Toronto." Curtin said of what needs to happen against Toronto to get a win, "They're a good team. Again, anytime you play a good team in their building, it's going to be difficult. The good news is we played there less than a month ago and had them down 1-0 and were pushing the game, pushing the tempo of things, gave up a goal but had a good performance in a draw. The guys know they can go there, it's a good field, the surface is great, we'll go there, we'll be brave and again we'll look to get a result against a good team." Marsch said of the possibility of playing Philadelphia next weekend, "We know it's a big possibility we could see them again. Philadelphia is a having a tough stretch down the end of the year but they are still a really good team. I think they play Toronto so I think they will give Toronto a good match and if they happen to nick them off then that's who we see. I think it's good for us to make a statement at the end of the year but if that is our match up when it's all set and done then we will be in for a tough game and series."